The HSC1300 is simply a “purpose built” cruising machine. If you want to tear up the boulevard, this is it! Sweet looks at a sweet price. Every HSC1300 Roadmith trike is built with the attention and craftsmanship needed to be a true extension of the Honda™ motorcycle itself. Take a closer look and you will see what we mean. Have fun, worry-free. INDEPENDENT REAR SUSPENSION: The smooth ride of the Roadsmith HSC1300 is primarily due to our innovative suspension system that offers a ride like no other trike. 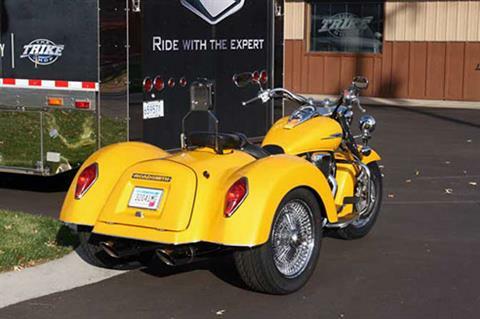 The Trike Shop was the first to offer Independent Suspension for trike conversions over 20 years ago. The cynics said it would never work. They’re eating those words today. 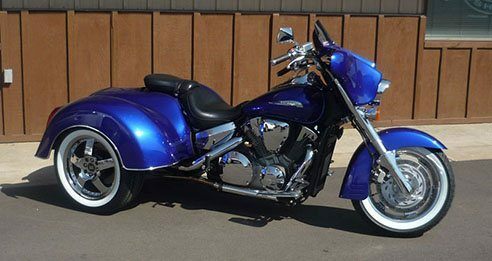 Talk to anyone who has actually ridden an Independent Rear Suspension and a solid axle system trike for a period of time and ask them which one rode better. You can’t deny Independent Rear Suspension is the way manufacturers of cars, SUV’s and ATV’s are going. 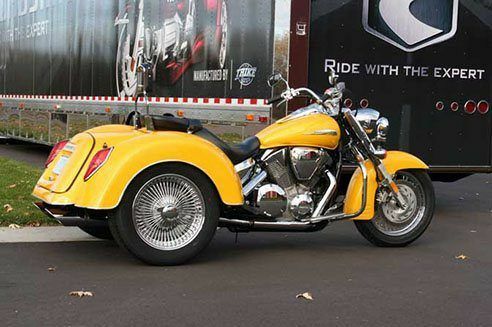 Trikes are no different. 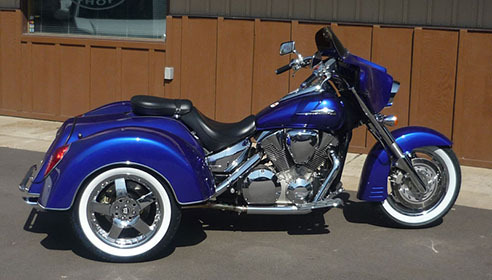 These trikes are built with a purpose- “Comfort”.The multi-point mount of the chassis to the bike frame actually strengthens the bike's frame as well as dissipates the added stress of a trike. We attach it to the existing mounting points on the frame like the swingarm mount and the upper shock mounts. A feature of the trailing arm type independent suspension is the fact that there are very few moving parts. There are literally only two pivot points on each trailing arm which are within urethane bushings. This eliminates any adjustments or maintenance requirements. There are more complicated way’s to design a suspension, but why? AUTOMOTIVE DIFFERENTIAL: Our differential is constructed from standard automotive ring and pinion gear sets. The original application of our differential was a Jeep. We cut down this cast iron housing and make an Independent Suspension differential out of it. The components inside it are all new including the 3.08:1 ratio ring and pinion. We make the gear ratio slightly deeper to retain the impressive power of the cruiser. TRAILER HITCH: With any touring machine a trailer hitch is a familiar sight. When riding a trike, a trailer is not a danger like it is on a bike. 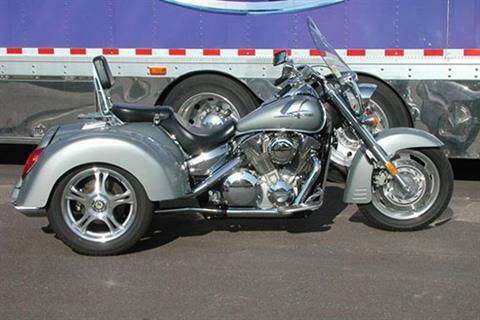 The trike will never feel like there’s a trailer behind it. We include a 1 1/4” receiver for a trailer hitch neatly tucked under the body. It is incorporated into the rear body support and is welded directly into the strongest part of our frame. With steering kit - 76 in.